​The Pentagon’s budget is anything but peanuts, yet one outspoken lawmaker says the US military is wasting its defense spending on produce and elephants, rather than weapons and technologies to ensure dominance in the world. US Senator John McCain (R-Arizona) took aim at the Department of Defense during an event in Washington, DC on Thursday over what he called "years of mistakes and wasted resources." 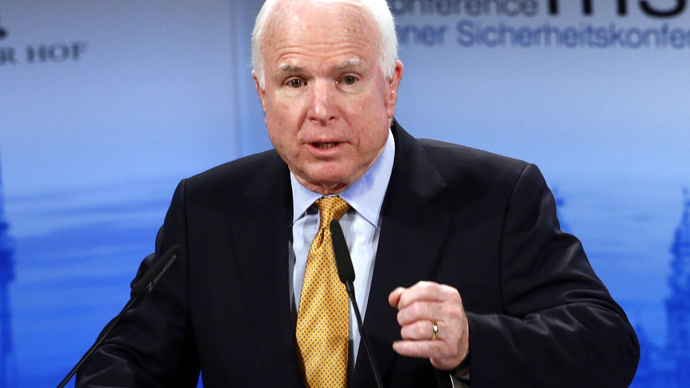 Speaking at the Center of Strategic and International Studies during an address in which he discussed his role as Senate Armed Service Committee chairman, McCain told his audience that a recently revealed study on the bomb sniffing ability of elephants is one of just many issues he has with the DoD’s spending habits as of late. - Bomb-sniffing elephant study. "Thus far they have found that, while elephants are more effective than dogs, using them is impractical." - DoD spends $48 million annually to ship $25 million worth of produce to US bases in the Pacific, rather than buying locally. - The National Guard paid $2.4 million for advertising with professional sports, including professional snowmobiling, while halting training for many units due to lack of funds. "We must root out this waste all the same. And it will be a priority for me as chairman to do so," he added. Other examples of Pentagon’s wasteful spending McCain invoked were $48 million spent annually to ship $25 million worth of produce to US bases abroad, and $2.4 million the National Guard paid for advertising with professional sports - despite halting training for many units on account of being broke. The Arizona senator blasted the Defense Department's procurement procedures, which he said lacked in accountability and resulted in an 'innovation gap'. "Our failing defense acquisition system is not just a budgetary scandal; it is a national security crisis," McCain said. The seemingly dubious elephant study referenced by the senator made headlines earlier this month, when the Associated Press first reported that the US Army Research Office was a major financial backer in an experiment conducted in South Africa, which was held to see if pachyderms could surpass dogs with regards to bomb sniffing abilities. "Their world is primarily olfactory," George Wittemyer, an assistant professor at Colorado State University's Department of Fish, Wildlife and Conservation Biology, told AP. "The sensitivity is recognized as being unparalleled." According to the report, elephants clocked near-perfect scores when subjected to certain smell tests. In one exercise, a test animal wrongly identified only 18 out of 502 sample buckets as containing TNT, suggesting elephants may indeed soon give canines a run for their money. A Gallup poll released last month revealed that nearly one-third of Americans, 32 percent, said the US is spending too little on defense. For fiscal year 2016, the White House has asked Congress to approve a budget of $561 billion for the Pentagon – the most ever in American history.